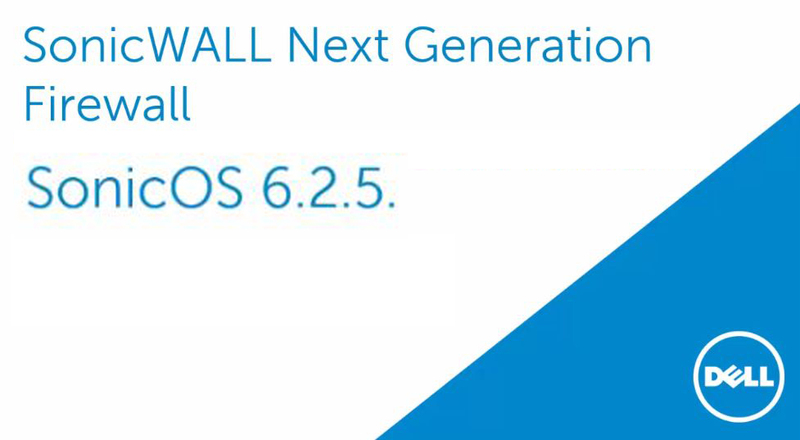 April 1, 2016 – Dell Security today announced the release of SonicOS 6.2.5 for Dell SonicWALL SuperMassive, NSA and TZ Series firewalls. This new firmware extends security to Dell switches, wireless access points and firewalls by consolidating the management of the converged network infrastructure. The release also significantly advances capabilities associated with inspecting encrypted traffic, a major threat vector in today’s malware economy, and meets strict certification requirements of the US Department of Defense. SonicOS 6.2.5 simplifies support for Dell Security partners by providing one version of firmware to handle the majority of Dell SonicWALL products. The new SonicOS also increases connection counts on encrypted HTTPS sessions, enabling stronger encryption support and expanding government certification for high security applications. It simplifies network management for both distributed enterprises and managed service providers by allowing management of the Dell Networking X-Series switches by SonicWALL TZ series firewalls and SonicWALL Global Management System, enabling central management of distributed converged networks. This release also improves performance, increases flexibility and makes systems more secure against today’s more sophisticated attacks. New Dell Networking X-Series Switch Integration: Organizations now can effectively manage Dell X-Series switches as an extension of the Dell SonicWALL TZ series firewall functionality, providing single-pane-of-glass management of all network infrastructure, including SonicWALL TZ firewalls, Dell X-Series switches, SonicWALL SonicPoints and SonicWALL WAN Acceleration devices. The ability to centrally manage all of the switches, firewalls and wireless access points in an increasingly dispersed network is a significant benefit for organizations in all industries. Dell SonicWALL TZ Series integration with the Dell Networking X-Series switches delivers the necessary security and expandability without the burden of having extra management consoles that increase complexity, overhead costs, and result in the potential for misconfiguration and non-compliance issues. Dell Security has achieved prestigious Department of Defense certification for Dell SonicWALL next-generation firewalls. Based on stringent Security Technical Implementation Guide (STIG) testing, designated Dell SonicWALL firewall products now are certified for the DoD Unified Capabilities (UC) Approved Products List (APL), and qualified for use by Department of Defense (DoD) agencies in the United States. SonicOS 6.2.5 is available on Dell SonicWALL SuperMassive 9600/9400/9200, NSA6600/5600/4600/3600/2600 and TZ600/500/500 W/400/400 W/300/300 W/SOHO W next-generation firewalls worldwide, through the channel. A complete list of the new features found in SonicOS 6.2.5 is available in this datasheet. The Dell SonicWALL TZ600/500/500 W/400/400 W/300/300 W next-generation firewalls with integrated Dell X-Series switches running SonicOS 6.2.5 are now generally available through the channel.